For rent this modern, bright 2-room apartment of approx. 62 m². Superbly located on the very central and quiet “westerdoks-eiland”. Within walking distance of the Central Station, the Jordaan, the Haarlemmerstraat/ dijk, where all kinds of shops, cafes and restaurants can be found. The living here is easy on the water. Beautiful relaxing views, but the hectic city is not a 5 min. walk away. This wonderfull and furnished apartment is located in building "La Grande Cour". A beautiful building consisting of 253 apartments, and was finished in 2008. Central entrance with access to the elevator. The apartment is located on the 2nd floor, and offers great views over the water of the Westerdok. Entry apartment in the hallway. Bright living room at the water-side of the apartment, with an open plan kitchen equipped with built-in appliances. Spacious bedroom at the front side , with a double bed and large wardrobe. Bathroom with shower, washbasin with mirror, and washing machine. Separate toilet with hand basin. Spacious indoor storage. 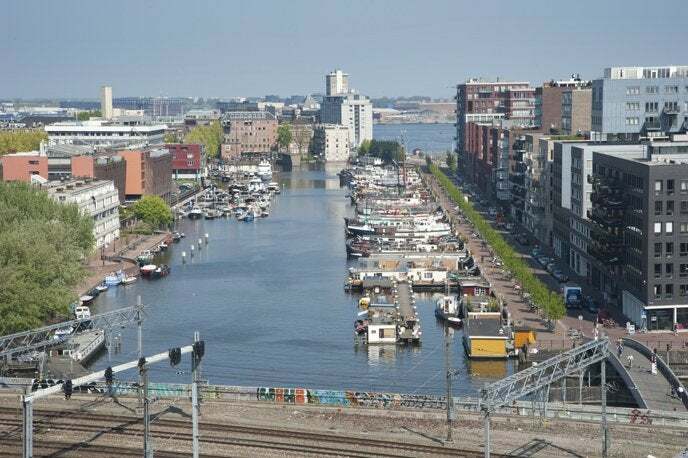 Residents have access to the communal roof terraces with a beautiful view over the water of the “IJ”. Tenant also can make use of the courtyard on the ground floor. - Communal bicycle parking in the basement. - Apartment's available per May first, and available for a period of 24 months max.